Cassidy Funeral Home, 156 Willis Ave., Mineola. 2-5 p.m. and 7-9:00 p.m.
Eternal peace grant unto him O Lord. We just received word that John Reedy died a few hours ago of a massive stroke and heart attack. He survived by his wife Maureen and four wonderful children and his brother Gerry. Fr. Kettlebnerger experienced how nice it is nice to be remembered as the representative of the VIncentians some 35 years after leaving “Queens”, Our Lady of the Miraculous Medal Parish in Jackson Michigan. On June 25, 2017, the parish invited the last Vincentian Pastor, Father John Kettelberger, CM to participate in the Blessing and dedication of the newly built parish center which has been named “Vincentian Hall “ in honor of the 37 Vincentian Priests who served the parish between 1934 and 1996. The new hall features a beautiful plaque of dedication as well as a beautiful statue of St. Vincent de Paul. During his remarks at the dedication, Father Kettelberger, CM. spoke of the importance of this year for Vincentians who are celebrating the 400th anniversary of the birth of the Vincentian Charism. Father John spoke of how humbled and proud the Vincentians were at seeing how faithfully the people of Queen’s Parish continued to live out the Vincentian spirit in their concern for the poor of Jackson county and beyond. Frs. Joe Elzi, Henry Bradbury, Mike Kenndy and Tom Kenndy are the only other living confreres who served there. All four reside at our Motherhouse. Fr. Elizi holds the distinction of being the only member of the Eastern Province to be born and raised in “Queens”. See the full list of confreres below. In 1934 Bishop Gallagher invited the Vincentians of the Eastern Province to come to Jackson, Michigan and establish a parish on the west side of the town as well as become Chaplains to Southern Michigan prison and Mercy Hospital. The first Mass for the parish was celebrated by Father Leon Cahill, CM celebrated the First Mass for the parish on June 25, 1934, in the Knights of Columbus Hall. The Vincentian Community served the people of Jackson for the next 62 years in the parish which they named Queen of the Miraculous Medal as well as Southern Michigan Prison and Mercy and later Foote Hospitals. In 1996 the Vincentian Community withdrew from Jackson and priests of the Diocese of Lansing assumed leadership of the parish. To put his history into context it might be helpful to realize that 1934 President Roosevelt was making plans for a radical new program that would become known as Social Security. Rev. Michael J. Kennedy, C.M. Rev. Joseph F. Keenan, C.M. Rev. James T Twomey, C.M. Rev. Francis X. Desmond, C.M. Rev. F. Leon Cahill, C.M. Rev. John H. Dougherty, C.M. Rev. Arthur J. Keegan, C.M. Rev. Francis J. McCormick, C.M. Rev. E. Louis Lawler, C.M. Rev. Francis X White, C.M. Rev. Vincent E. Trunk, C.M. Rev. Thomas D. O;Connor, C.M. Rev. Francis B. Hinton, C.M. Fr. Tom McKenna recently wrote of facing the tension between doing and being praying and acting. And yet somehow Vincent pulls it off. Not self-contradictory, he makes so much practical sense in the end. (Just don’t pick him up on the wrong day!) He’s a master at holding seemingly opposite things together, especially in the spiritual life. Not an either/or person, he’s a both/and. And he doesn’t do it so much by keeping a balance between two seeming opposites as by holding them in tension, each tugging at the other, each circulating back into its contrary, each pulling its opposite number back on vertical. Matthew 25, a favorite Vincentian text, highlights one side of a well-known tension in the spiritual life, that between doing and being, action and contemplation. Jesus’ “Whatever you do to the least ones, you do unto me” weights the doing end of the spectrum. Anyone looking in would observe how our Family genes incline us more toward this side of the tension: action, deeds of peace and justice. “What are we to do?” has been named as The Vincentian question. If this is an issue for you continue reading his reflection Vincent’s Praying-Acting Cycle. On June 28 of 2017, Mark McGreevy, of the Famvin Homeless Alliance, addressed a gathering at the European Parliament to honor the 400th anniversary of the Vincentian Family. Here in its entirety is Mark’s address, courtesy of the Congregation of the Mission. The Eastern Province joins the rest of the Vincentian Family in this major international initiative. So many inspirational speeches… I’ll give it a try. President Tajani, members of the Parliament ladies and gentlemen, Vincentian brothers and sisters. Thank you for inviting me to speak at this event to mark the 400th anniversary year of the birth of the Vincentian charism. As President Tajani mentioned, this charism is best summed up in the story of the poor and ailing family in the parish of Chatillon (France) where Vincent was serving as a parish priest. The family was too sick to work or to even leave their house and Vincent realized that if they were to survive they needed material aid – food, water and nursing care. Whilst celebrating Mass he implored his congregation to help. Later on that same day he went to visit the family with bread, cheese and milk. On the way Vincent met many of his parishioners who had responded to his plea for help and they were also carrying food and drink for the family. Vincent could see that there was too much food being provided – that the bread would go stale and the milk would turn sour. There was no plan to even out the supply over the coming days and weeks. It was at this point that Vincent realized that there was “great charity” but that it needed to be properly organized if it was to be effective. He said “it is not enough to do good, we must do it well.” So the Vincentian charism to encourage and organize charity was born. From that point on Vincent devoted himself to the organization of charity beginning in France before spreading out across Europe and then around the world. He would have had no idea how such a simple concept, 400 years ago, would, in time, grow into an international movement of over two million people incorporating over 250 religious and lay organizations who claim Vicente as their founder and the organization of charity as their mission. Nor would Vicente have guessed at the size and scale of the works of charity currently being undertaken by the Vincentian Family globally, serving millions of the world’s “poorest of the poor”. In 1950 only 746 million people lived in our cities. That grew to 3.9 billion in 2014 and will reach 6.4 billion by 2050. This is placing tremendous pressure on housing and services as urbanization gathers pace. And we need to think this. There are rising numbers of street homeless people here in Europe and across the world (I travel a lot around our European capitals and in most capitals I go to, this got worst, not better, in the last 10-12 years). to make a real and sustainable difference to the lives of hundreds of thousands of homeless people globally by encouraging the growth of new services for refugees, slum dwellers and street homeless people. to build a strong network between existing Vincentian groups working across the spectrum of homelessness globally. to lobby for structural change in support of homeless people at a national, regional and global level including here in the EU. With the help of the Institute of Global Homelessness in Chicago, to end street homelessness in 150 cities across the world by 2030 in collaboration with other agencies and government officials. The Vincentian Family has asked the charity I work for — Depaul International — to coordinate this work on behalf of the Vincentian Family. Depaul International works with homeless people in numerous countries including several European states – UK, Ireland, France, Slovakia, Croatia and Ukraine serving over 20,000 homeless people. I would welcome connections with parliamentarians from those countries and indeed all countries where the Vincentian Family is present. We need your help and support to grow this mission and end the structural injustice and personal tragedy which is homelessness. I have a particular message, if you don’t mind, for the parliamentarians in the audience today. The EU, to its great credit, was instrumental in shaping the United Nations 17 sustainable development goals SDG) to be delivered by 2030. Of the 17 goals three are particularly relevant as to why we need to end homelessness. The first is SDG 1 – Eradicating poverty in all its forms – admittedly poverty globally is relative but surely here in Europe eradicating poverty means an end to people living on our streets or in temporary shelters. This is not a matter of charity, this is a matter of justice. The second is SDG 3 – Ensuring healthy lives and promoting well-being for all at all ages. In my view, housing is a social determinant of health and there is overwhelming evidence that homelessness is associated with ill-health and dramatically lower than average life expectancy for those who live in the streets. We need to be better for those people in the streets. Finally, SDG 11 – Making cities and human settlements inclusive, safe resilient and sustainable. This goal includes providing safe adequate housing for all. By definition this includes preventing and addressing homelessness. We are glad that the EU has been engaged in creating these SDGs and committed to these goals and, as the elected representatives in this room, we hope you hold the Commissions accountable to deliver this. Finally, I note, from its website, that among the European Union’s fundamental values are respect for human dignity, the defense of human rights, the promotion of equality and the wellbeing of every citizen. In short ensuring that everybody is treated fairly. Those values represent a world view that was shared by Vicente de Paul and continue to be shared by the two million members of the Vincentian family globally. We very much want to be partners in your mission and make those values come alive for homeless people across the world. Vincent was a bridge between the powerful and the powerless, between the rich and the poor, between ideas and action. I hope that together we can build bridges to ensure everyone in Europe, indeed everyone in the world has a place they can call home and a stake in their community. Recently I was asked to preach at one of the Mondays of the Summer Novena of Hope. The topic: “What is The New Evangelization?” I have grown up with the Vincentian tradition of the Miraculous Medal Novena. Over the years, I have often reflected on “The New Evangelization”. But a funny thing happened as I tried to put the topic and the context together: I discovered that I was a slow learner. As I prayed over the topic in the weeks preceding, I came to an insight that had been right before my eyes for the more than 50 years of my priesthood. I realized a simple insight into the reality of the New Evangelization and that insight gave me an even deeper insight into what happens when people come to the Shrine of the Miraculous Medal here on the grounds of the Motherhouse of the Eastern Province of the Congregation of the Mission. The insight that linked the two together was something a woman wrote to me shortly before ordination in 1965. First a bit of history of my understanding of the word evangelization. In my formative years, “evangelization” was not a word we Catholics used. In the climate of mid 20th century United States, it was a word that Protestants used frequently. A second bit of background lies in the fact that I had never preached The Summer Novena of Hope at the Miraculous Medal Shrine until this year. The net result was that I had never tried to put those two things together. It was that experience of being loved that turned her life upside down for the past sixty-five plus years of marriage. That includes her husband and childhood sweetheart, four children, nine grandchildren and a still growing generation of great-grandchildren. Sharing awareness of being loved has become a lifestyle for her. Of course, she would be the first to admit that she has not always succeed in living that lifestyle. But being aware of being loved turned her life upside down and, in turn, the lives of others. Recalling that insight led to another: this time it was an insight into the man who is waking up the world and the church to what it means to have your life turned upside down — Pope Francis. Let me use this lens to understand the life of a man like Pope Francis. He is confusing to many. Is he a liberal? Is he a conservative? There are all kinds of opinions on that. One thing most people can agree on is that he REALLY loves everyone, especially those society does not see. And you can see it when he kisses a badly disfigured man most of us would turn away from. Or when he washes the feet of prisoners. And, most obviously, when he smiles. If there was ever a smile that could light up a room… It is very hard to be in his presence without feeling his warmth and love. Keep this mind when you see a picture of him keeling at an open confessional in Rome confessing to another priest. His life has become a living example of sharing his good news of being aware of being loved no matter what. Of course, Francis also would be among the first to say he has not always communicated that sense of being loved to others. There was a period in his life where others saw him as a stern and rigid legalist. But for the last 30 or 40 years this is what has consistently motivated him to sharing that awareness of being loved. That insight 50 years ago has now led me to imagine Jesus as communicating that sense of being loved. Why else would people drop their nets and follow him? Why else would they tell their brothers and sisters and friends about their meeting with him? Why else would the woman at the well excitedly say, ‘he knows everything about me and yet he loves me’? This is true of the disciples on the road to Emmaus and so many others who, in the pages of the New Testament, recount their encounters with Jesus. His disciples experienced an awareness of being loved… and ran to tell others about it! I now realize that is is what we mean when we speak of the Gospel as Good news and the writers of the Gospel as Evangelists or tellers of Good News. So, in every day language, evangelization is sharing with others the awareness of being loved. It is not the experience of getting 100 on an orthodoxy test. It is not the experience of Pharisee justifying himself. It is the experience of knowing one is loved and trying to bring that awareness to others. So what is new about the “New Evangelization”? Pope John Paul II has made the expression “New Evangelization” part of the contemporary Catholic vocabulary. But it is actually rooted in Pope Paul VI. Few topics have received more attention in the Church in recent years. He speaks of an evangelization that is new in ‘its ardor, in its methods and in its expression’. Now what about the connection with the Miraculous Medal Novena? I believe people who come to the Miraculous Medal Shrine experience the sharing of good news, and it can turn lives around. As people listen to the sharing of favors others have received, — maybe the announcement of a favor we have received — hopes comes alive. People come to the novena hoping that their lives will be similarly blessed. But we also face the fact that it does not always turn out the way we expect. Sometimes we come almost demanding this or that sign that God loves us. When nothing seems to happen we are temped to give up hope. And yet we get signs, sometimes hiding in plain sight, even if not in the signs we set as criteria for our experience of being loved. I am sure you have heard it said of the visitors to Lourdes: “The greatest miracles at Lourdes are not those of physical healing.” Few people leave Lourdes without a gain in faith. Moral and spiritual cures are more marvelous than physical cures. Some go to Lourdes with lifetime prejudices, yet their minds are cleared in a sudden manner. Frequently skepticism gives way to faith; coldness and antagonism become whole-hearted love of God. Again and again, those who are not cured of bodily pain receive an increase of faith and acceptance of a bigger picture – true peace of soul. They come away with an understanding of why Jesus suffered so much: to show us we are loved by God. The biggest miracles for those who pray the novena of the Miraculous Medal is that they become aware of being loved and committed to sharing that awareness of being loved with all they meet. “My child, the good God wishes to charge you with a mission.” Do we make it our mission to share the awareness of being loved? Fr. John Freund, C.M. is a Vincentian priest who recently celebrated his fiftieth anniversary of ordination. He spent forty of those years in higher education, teaching in Major Seminaries and serving on numerous boards including those of Niagara University and St. John’s Prep. John also served two terms as Chair of the Department of Theology at St. John’s University in New York. Committed to serving those marginalized by society, John has made enormous contributions to connecting the followers of St. Vincent de Paul and St. Louise de Marillac in various branches of the Vincentian Family through famvin.org. Through workshops on internet and digital practice as a means of connecting and sharing information, he has helped connect over a million members who serve the poor and the marginalized in more than 150 countries. The pope has named Vincentian Father Andrew Bellisario C.M., currently serving in the Archdiocese of Anchorage, Alaska, to head the Diocese of Juneau, Alaska. The Diocese of Juneau comprises 37,566 square miles and has a total population of approximately 75,000 people of which 10,000 or 13 percent, are Catholic. Father Andrew Bellisario, C.M. was born in Los Angeles on December 19, 1955. He was previously the Provincial of the Congregation’s Western Province. Bishop-elect Bellisario began Vincentian novitiate studies in Santa Barbara in 1975 at St. Mary’s Seminary and professed final vows at St. Mary’s Seminary in Perryville, Missouri in 1978. He was ordained a priest in Los Angeles on June 16, 1984. He earned a Bachelor of Arts degree from St. Mary’s Seminary in Perryville in 1980 and later earned a Master of Divinity degree from DeAndreis Seminary in Lemont, Illinois in 1984. Superior, International Missions in Alaska (2015-present). Fr. Frank Sacks, CM, shares photos or videos along with his weekly reflections on the spirituality, history, and breathtaking art of the Miraculous Medal Shrine. The inaugural video presents some never before seen panoramic views. Click the following link to view the first installment of Miraculous Medal Shrine Reflections. The reflections will be available in our Weekly Marian Reflection e-blast and on our website under the Prayer Ministry tab. They even offer an option viewing the text that accompanies the video images. Welcome, everyone! My name is Fr. Frank Sacks, CM. I presently serve as one of the Associate Directors at the Central Association of the Miraculous Medal. Allow me to introduce you to our new series; it’s entitled Miraculous Medal Shrine Reflections (or the shorter version: Shrine Reflections). In the weeks ahead, we’ll share the beauty of our Miraculous Medal Shrine, as well as additional images in our larger Chapel of the Immaculate Conception. Typical of all our Vincentian churches, there is a side chapel in the eastern transept, and it honors the Holy Agony. This side Chapel focuses here on Mary’s role in Jesus’ death and resurrection. Moving to the right, one sees the large sanctuary dedicated to Our Blessed Lady. The large paintings of the Annunciation, the Immaculate Conception, and the Birth of Christ emphasize Mary’s place in God’s plan of Salvation. Moving further right past the altar dedicated to St. Vincent de Paul, one sees the more recent Shrine of Our Lady of the Miraculous Medal. This gorgeous Shrine replaced the original Shrine of St. Vincent that was located in the western transept. The Miraculous Medal Chapel was dedicated in 1927, 12 years after the establishment of the Central Association of the Miraculous Medal. It is this holy Shrine of Our Blessed Lady that remains the central focus for our devotion to our Lady. Every Monday, we celebrate eight Novena services at the Shrine, including Novena Prayers to Our Lady of the Miraculous Medal with Mass, Benediction, and opportunities for the Sacrament of Reconciliation. Throughout this Miraculous Medal Shrine and the larger Chapel of the Immaculate Conception, there are inspiring frescoes, mosaics, paintings, stained glass windows, marble statues and altars and many other religious artifacts. Most of these in some way give honor to Our Blessed Lady. In the weeks ahead I will be reflecting with you on these images. Each week, we will examine one of the images. Each will lead to some spiritual reflection concluding with an appropriate prayer of the week. Devotees of the Shrine will be encouraged to email me their own thoughts and prayers. Please keep our Shrine Reflections in your prayers. Thank you for your interest and especially for your devotion to Mary. May you always remain close to Our Blessed Lady. Where Are Vincentians in the World? What is the big picture of Vincentians in the world? Recently, the new international catalog of the Congregation of the Mission arrived. I began to page through this latest edition and lovingly and out of curiosity I began to analyze the data and the numbers. I pondered the reality that is behind much of this information, and as a result, I would like to share with you some of the highlights of my “investigation”. Without a doubt, the Congregation continues to be an incredible reality and there is a very significant presence of the Vincentian charism in the Church and in the world. We, as members of the Congregation of the Mission, are in 91 countries: 28 countries in Europe, 24 countries in the Americas, 21 countries in Africa, 13 countries in Asia and 5 countries in Oceania. There has been a decrease in numbers, not a great decrease, but a decrease nonetheless. In comparing the numbers with those there were recorded in the 2014-2016 catalog, we can state that previously there were 3,202 confreres and today there are 3,157 (45 less – not a very significant number, but one that represents the fact that we are declining in numbers). Analyzing the previous data with regard to persons and works we discover that previously there were 2,931 priests and today there are 2,893 (38 less); there were 143 Brothers and presently there are 137 (6 less). Previously there were 39 incorporated members and today there are 38 (one less). Previously there were 50 provinces and today there are 43 (seven less — obviously in this matter the situation of reconfiguration has to be taken into consideration). Previously there were 512 local communities and that number has varied very little since today there are 507 local communities. This next number is very disconcerting: there are only 16 provinces out of the 43 total provinces that have incorporated students (in other words, in 27 provinces there is not one single young person in formation who is presently incorporated) Colombia has the greatest number of incorporated students (6). With regard to the number of confreres, there are 10 provinces that have more than 100 confreres and Colombia is third in this list. The provinces with 100 or more members is as follows: Poland, 260; Spanish province of St. Vincent, 200; Colombia, 187; Western USA, 158; Southern India, 149; Italy, 146; Eastern USA, 117; the Philippines, 117; Indonesia, 105; Northern India, 103. With regard to median age, the province with the highest median age is Ireland (77 years) while Cameroon has the lowest (42.3 years). Colombia with a median age of 54.6 is in 22nd place. Our brothers continue to be a richness for our Congregation and their number continues to be stable. The Provinces with the largest number of Brothers is as follows: Spanish province of St. Vincent, 20; Western USA, 16; Colombia, 12; France, 11; Madagascar and Rio, 8; Eastern USA, 6. Another interesting piece of information is with regard to the permanent diaconate: there are only two permanent deacons in the Congregation, one in the Western USA and one in Italy. Yes, there is still more information that has to be gleaned and studied, but for the present time, I share with you this information. Seventy-eight years! That is how long Fr. Lou Trotta has memories of “St. Joes”, our former prep seminary and currently the final resting place for the majority of confreres of the Eastern Province. Along with 17 others, he arrived there for the first time in September 1939 as a 14-year-old. Fr. Luigi Scialdone, C.M. recommended that he follow in his footsteps as a Vincentian. In the Spring of 2017, he returned once more to the property which has now been converted into the Princeton Abbey and Cemetery. The architectural gem of the neo-gothic English style chapel whose construction began in 1932 still stands. as do a number of other buildings added to the original building that opened in 1914. I had the opportunity to interview him about the flood of memories that came back to him during his recent visit. Since he his first setting foot one the property his life has frequently intersected with this ground hallowed for so many Vincentians. The years from 1939 to 1945 provided a foundation upon which he built over his 65 years of priesthood. But he also vividly remembers how he almost died in a diving accident. He entered our Novitiate in Germantown in 1945 and then completed his preparation for ordination in 1952 after six years at Mary Immaculate Seminary. Editor’s note: I met him for the first time when he and I arrived at St. John’s Prep in January 1952. He taught Latin and Religion there until 1955. In that year we both found ourselves at St. Joes’. I was a first-year collegian and served as Prefect of Students until 1961. From 1961 through 1966 he served as Novice Master in Ridgefield, Connecticut. Then began his almost 40 years at Niagara University in a variety of administrative roles. Since 2004 he has ministered at our Motherhouse in Germantown. Of course, he returned to Princeton almost every year for the July 19 celebration of the feast of St. Vincent. These gatherings ceased in 1967. Over the intervening years, there have been various provincial meetings and Assemblies on the property until it closing as a seminary in 1992. The buildings were repurposed as a retreat center and center for youth programs until 2009. Faced with the dilemma of what to do with the large campus, which was not in use but costly to maintain, the community explored other options which would preserve the architecture and the beautiful historic look and feel of the buildings. The solution was twofold: lease the school buildings to other educational institutions, and turn 12 acres of the 87-acre grounds into a cemetery. In 2011 Plainsboro Township rezoned the land to allow the cemetery plan to take shape. A mutually fortuitous breakthrough occurred with an agreement with CMS Mid-Atlantic, Inc. which provides cemetery management and consulting services to the cemetery industry throughout New Jersey & New York. They developed a plan to make a cemetery of the 12 acres on the west side of the campus in five phases of construction. This allowed the preservation of our community cemetery laid out in 1934 and currently contains the remains of over 450 members of the Eastern Province. The new layout of the cemetery will preserve existing trees, and utilize a tree-lined buffer zone between the graves and the edge of the property. The chapel itself — redubbed Princeton Abbey — is being transformed into a place to hold cremated remains, and will also be open for special events and concerts. The chapel’s acoustics, optimized for church music, allow two people to have a speaking-voice conversation while standing at opposite ends of the sanctuary. This brings us to Fr. Trotta’s visit this Spring. As he sat in the chapel he was filled with gratitude and awe remembering that it where he first learned of the apparitions of Mary to St. Catherine Laboure. He remembered the days when the legends of our community celebrated masses on the side altars and sung masses celebrated in the crypt below the main chapel. As he sat in the midst of the beauty he remembered and the beauty of the transformation of the sacristy and crypt he realized he now had a choice of whether to be buried in the still active cemetery of the Community or in one of the niches reserved for the ashes of a slowly increasing number of confreres choosing cremation. 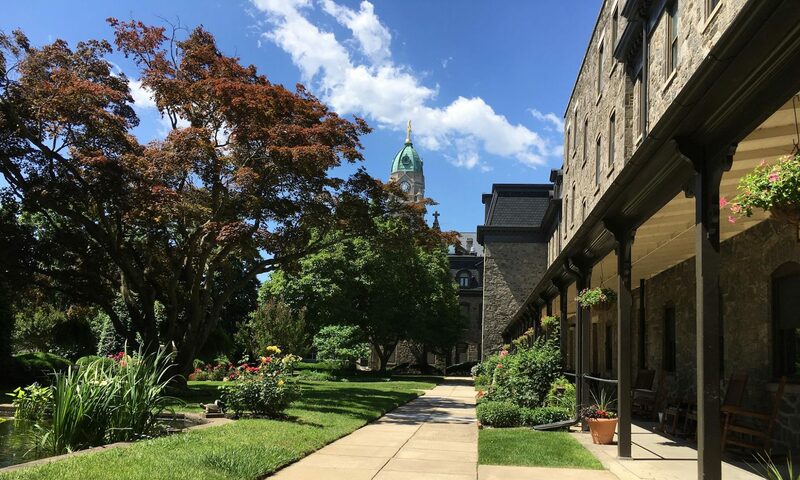 Please enjoy the following gallery from the Princeton Abbey Viewbook to appreciate the beautiful transformation of the place that is so special not only to Fr. Trotta but all the confreres.